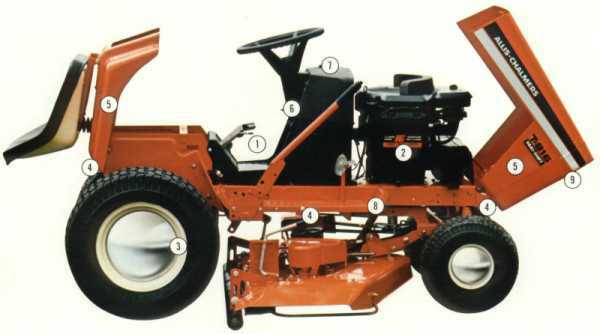 Big tractor features in a compact package . . .
Click each number to see the specific feature. 1. Infinite Range, Vari-Shift Drive. 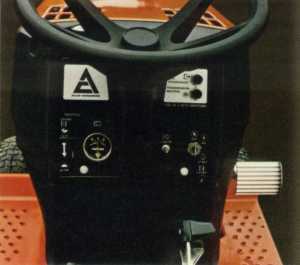 A-C designed and built four-range, cast iron transaxle and unique variable speed system provide four distinct ranges (3 forward, 1 reverse), allow PTO speed to remain constant while ground speed is adjusted - with a single convenient hand lever control. 2. Brute Power That's Smooth and Quiet. Reliable Briggs & Stratton four-cycle engines mean power a-plenty, with minimal noise and vibration. All T-800 series tractors feature Industrial/Commercial Briggs & Stratton engines with cast iron liners: stellite hardened valves, seats and valve rotators for longer life. Dual element air cleaner for better engine protection, and solid state ignition for a better spark, sure starting and low-cost maintenance. 3. Controlled Traction. T-800 Series tractors offer sure-footed traction through mud and snow because the transaxle differential automatically transfers power to the rear wheel with the best traction. 4. Power Take-Off. Convenient rear PTO eliminates the need for a separate engine or complicated adaptor kit to power the tiller attachment. 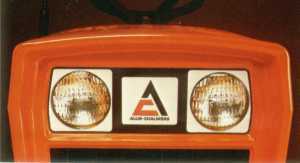 The Allis-Chalmers Quick-Hitch attachment mounting system makes front, center or rear attachments easy and simple to mount. 5. Tilt-Up Hood and Seat Deck. Easy accessibility to engine, battery and other components is provided via the tilt-up hood, grille and seat. Simplified routing maintenance adds to long tractor life and optimum performance. 6. Quick Responsive Handling. 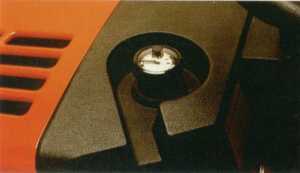 All controls are conveniently grouped within easy reach, around the easy-to-read instrument panel. Heavy-duty geared steering delivers responsive, smooth handling. Tight 24" turning radius allows precise maneuverability, while big, high-flotation tires treat fine lawns kindly without leaving tracks. 8. 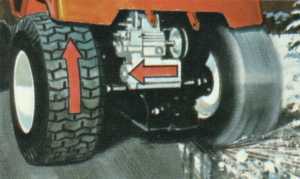 Stress-Absorbing Frame and Axle. One-piece solid channel steel frame and tough 1" x 3" steel axle means strength for heavy-duty service plus operational ability -- year after year. 9. Built-In-Headlights. Lengthen your working time when darkness threatens to call a halt. 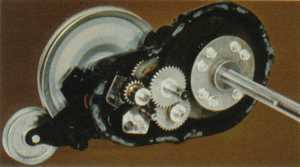 Headlights are standard equipment on the T-800 Series.